« Turn OFF Your TV & Turn On a Healthy Lifestyle! Thanks to a decent taper week and camping at Motel 6 in King City, California, versus sleeping in a tent at the camp ground, I went into the race feeling well rested. For breakfast, I had yogurt with fruit and granola, half cliff bar, and coffee. Thirty minutes prior to the start I took one salt tab and one bottle of PowerBar Endurance. The pace was very comfortable and the draft was awesome, but the leader of our mini-group (about five swimmers) turned out to be a poor sighter. We ended up way off course at several points. Half way back on the return swim the leader paused to sight and the rest of us sat up to look as well. I was surprised to see the main pack and buoy line almost fifty yards away to the right. We all looked at each other and I yelled, “You have to be kidding me!”, (as if I could have lead the group any better…yeah sure) and we all turned and made a push back to the main group. Despite the poor sighting, I stayed with the original mini-group because we had found a comfortable rhythm swimming together, so we zigzagged our way home for the remainder of the swim. Getting out of T1 was fairly uneventful. I found myself directly behind Coach Neil at the bike exit and saw Jaime taking a video and cheering. Of course, I had difficulty clipping into my pedals. After the fourth or fifth embarrassing pedal slip (who’s the newbie with the fancy bike??) I was finally riding. I tried to start on my PowerTap but noticed that the speed and power numbers weren’t reading. What the…? After pressing the buttons a few times the PowerTap computer head unclipped into my hand. Great, it wasn’t fully attached to the harness. The roads where bumpy so I had to wait for the first climb before I could safely reattach it. Thankfully the power numbers started reading. The new time trial bike felt great but average watts were down. I only averaged 230 watts (the bottom of zone 3) for the ride where I should have been closer to 250 watts. I felt great out through the “Nasty Grade” climb, but started experiencing cramping in legs during the last ten miles of the ride and definitely lost power during the last five miles. I ended up drinking a bit more than Coach Duane recommended purely out of thirst and took a lot more salt tabs in an attempt to stave off leg cramping, but it seemed like the nutrition wasn’t too far off overall. In total, I had 3.5 CarBOOM gels, 3 large bottles of PowerBar Endurance, 1.5 bottles of water, and five salt tabs. I must have been pretty out of it after the ride because I lost close to a minute in T2 searching for my bike rack. (It turns out that my rack was flipped around so the numbers in the row where out of sequence. I knew this at the start but somehow forgot by the time I was done riding.) I ended up standing in one spot for what felt like forty-five seconds looking back and forth before finally spotting my area. I racked the bike and made the transition to running. Jaime and her friends made a nice sign (“Go Brian, Papichurro!” Don’t ask.) and were polite not to laugh too loud at my silly T2 fumbling. Not that I’ve done many triathlons but for whatever reason I’ve never had a problem making the physical transition from cycling to running. This time was different. My legs cramped hard from the first step. I kept telling myself to just shuffle through the first mile and it’ll get get better. It eventually did. The flat and rolling sections were fine but I could definitely feel the onset of cramping on the uphill sections. The run was enjoyable but I was somewhat disappointed in that I couldn’t (or wouldn’t) motivate myself to run faster. I ended up settling into a comfortable, easy zone 1/low zone 2 heart rate pace for the entire run. I remember thinking that pushing any harder would change the complexion of the entire day and would end the fun. I was content to go slow. It’s strange because every second I’m on a bike, irrespective of whether I’m having a good day or not, I’ll race. If I have to dig deep and hurt more, I’ll hurt. When the running shoes are on however, I’m happy to simply plod along. It’s as if I have no competitive drive as a runner and am happy to just settle in. Competitive running is something I definitely need to work on. For nutrition, I had 2.5 CarBOOM gels and a mix of water and gatorade at every aid station. Overall, I had a blast. For my second half ironman, I learned a lot and felt completely comfortable through the event. I owe 100% of the 45 minute/injury-free improvement to Coach Duane Franks/Trifiniti. A huge thanks, Duane! Congratulations to everyone who raced Wildflower — especially to Jaime and members of the GGTC Tri & Give group for completing their first olympic distance triathlon (huge! ), Andreas Wolf for finding his bike legs and taking eleven whopping minutes off his previous Wildflower time, to Grant Richards for a strong age group finish, to Nate Helming for second place in his age group (holy smokes! ), Fred(nando) Mendez for finding a better race-day nutrition strategy and turning in a strong time without $5K of desperate person tri gear (who needs a wetsuit and aerobars? ), Coach Duane who is competitive even with reduced training, and everyone from the Golden Gate Triathlon Club who pushed GGTC into the number one tri club spot at Wildflower this year. Sweet! Good times. This entry was written by Brian McNitt, posted on at 4:54 pm, filed under Triathlon and tagged 70.3, ggtc, ironman, mcnitt, Triathlon, wildflower. Bookmark the permalink. Follow any comments here with the RSS feed for this post. Post a comment or leave a trackback: Trackback URL. Congrats on a great “comeback” race! Good luck this season and have fun! Awesome job on the swim – great time and it sounds like your strategy worked perfectly. Also great that you knew the event was supposed to be *fun* and ensured it was…great showing, strategy and attitude. Hey, Brian! Congratulations on a successful race. Your name seems very familiar to me. You ride with Alto Velo? Do you race bikes as well? And congratulations on your growing business (yes, I had insomnia and read your blog). As a small business owner, I know what a big move that is — I would totally miss my kitchen! Are you a mac guru? I recently switched to mac (december) and still haven’t moved my cycling-specific software (cycling peaks, computrainer, etc). No one seems to be able to help me….. I guess in the scheme of things, an extra minute in T2 is a very small percentage of the over all race. Nicely done. Running is my first love and worst discipline! Something I guess I’ll have to work at too. Nice job on one of the toughest half IM courses in the country! Bring on Hawaii!! 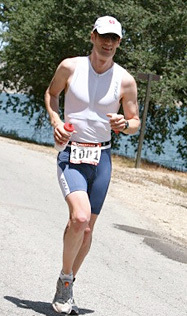 I did a handful of races with the AV3 team but have for the most part traded my cycling shorts for tri shorts. I grew up as a road and track cyclist and had a great time doing it but find that I’m a bit more risk adverse these days and enjoy swimming and running just as much so triathlon fits the bill nicely. As far as Mac stuff goes, I am a die-hard Apple user but I still keep all of my training apps on PC. Polar and PowerTap devices are still pretty much stuck in the PC world. I just ordered a Garmin Forerunner 305 which is supposed to have OS X software available. We’ll see how it works. I also have Parallels/Windows installed but have been lazy about trying to setup my Polar and PowerTap on it. It is possible though. If you have Parallels, try searching their support forums for Polar, etc. There is lots of information there. Congrats on doing your own business as well. It’s a lot of work but is equally rewarding and makes training for these crazy events a bit easier. A great video from TeamKman that gives you a sense of the swim start. Hey – Thanks for commenting on my blog. How strange that you and I had such similar times all the way through the race. Congrats on your huge PR. I’m not quite sold on the aero helmet yet, though. We’ll see what the next few races bring. I’m a die hard Mac user too…but I’m using Powertap on OS X with Poweragent…downloading my Polar data with Bootcamp…and importing it via an Excel macro and an automator script into PowerAgent. But I guess this isn’t much better than simply keeping all your data together on the PC side say, with Training Peaks. iSmartTrain is out there which allows imports from Polar and Powertap…but requires a serial IR interface and USB/serial adapter for the Polar.